The rediscovery of the 72 Angels tradition in the latter 20th century sheds new light on our age-old concepts of Angels as guardians and messengers. The long-hidden Angelic Kabbalah reveals the 72 Angels of the Tree of Life as energetic emanations of the Divine Light and Being which express the diverse qualities of the Divine within, and as, the diversity of humanity. In their loving and transformative support of our particular challenges, purposes and potentials, the Angelic Divine "angles" of light dwelling within and among us help us to realize our soul purposes and the greater truth of who we are -- that we are not "only human," but Divine-Human beings in a glorious dance of soul-body-heart-mind, here to bring the powers and purposes of the heavens to Earth through our own creations and relationships. 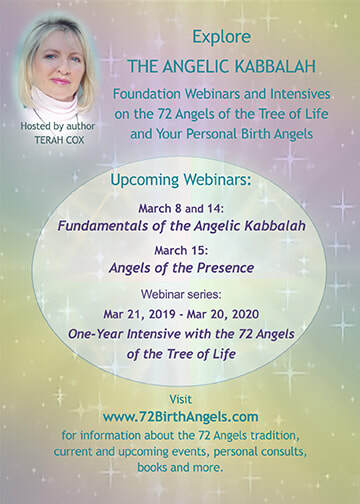 The foundation webinars and intensives offer you an understanding of the origin and nature of the 72 Angelic Energies, their purposes in your life and how to work and play with them on a daily basis in all the different aspects of your human being and doing. In addition, as you learn to work with your personal Birth Angels, you will come to understand what aspects of the Divine you are here to uniquely embody and express, and how to work with both your light and shadow potentials to manifest more of your soul totality here on Earth. In addition, just as with other self-discovery systems, the correspondences of the 72 Angels tradition with astrology, numerology, the Aura-Soma color system, Human Design, the Ageless Wisdoms, the Enneagram and other traditions and practices can enhance the work of practitioners and healers of all kinds. 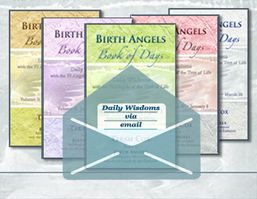 The Daily Wisdoms via Email gives us a convenient way to access the Wisdom of the day's Heart Angel on our devices wherever we happen to be. Helps to sustain a daily practice of spiritual attention and ongoing heart-and-soul awareness of our inner Angelic Divine, and the gentle but deeply transformative opportunities they bring to the days and moments of our lives. The first cycle of daily messages begins March 21, with each cycle spanning 72 +/- days. Sample: Read the Daily Wisdom for 72 MUMIAH / August 16 here. 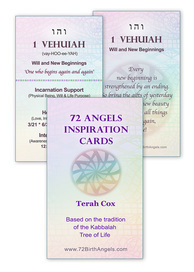 The 72 Angels Inspiration Cards have been a big hit in our family of practitioners, students, teachers and all-around Angel lovers who are interested in the unique aspects and roles of the 72 Angels as presented in the Angelic Kabbalah. The cards help to remind us of the day's Heart Angel, which expresses specific qualities of Divine Love and Wisdom in the human heart, and they also offer a bit of inspiration in support of our human challenges, purposes and potentials. Includes the Hebrew letters for each Angel's name. In this season of the year which symbolizes our cosmic birth, the Daily Wisdoms help to bring us into a daily practice of soul-awareness and engagement with the 72 "angles," or qualities, of Divine Light. In the inner Divine alchemy of deepening awareness, we begin to feel a subtle awakening as the Angelic takes root within our hearts and our transformation begins. We come to realize that we are not "only human," but Divine-Human beings -- on this Earth to express and expand the diverse nature of the Divine Oneness through our unique individuations and the diversities that compose all of Creation. 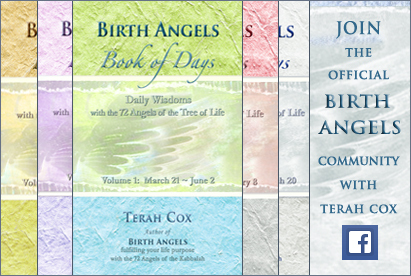 Representing the author's deepening work with the 72 Angels since the original BIRTH ANGELS book, these loving and profound messages invite us into daily soul awareness and communion with our inner Divine. Through the 72 "angles" of Divine Light which express qualities of the Divine within our humanity, our unique purposes and potentials are illuminated and our challenges become grist for transformation and new vibrancy in every aspect of our lives. Check in with us on Facebook for announcements and special postings.